The first 15 minute Short Trek landed at the beginning of the month shortly before a brand new Discovery season two trailer. So why not combine them into one Super SKoST post? Why not indeed. Being only a quarter the length of a ‘regular’ episode of Discovery, Runaway sees Ensign Tilly’s day take an unexpected turn when a strange alien interrupts her lunch. Able to cloak herself, Po is a Xhean who is trying to escape her own world for some - initially - unknown reason. The whole look of the show seems to have experienced something of a minor revamp with the visuals of the Discovery herself plus those of the shuttlebay both from space and internal are a definite shift up in terms of quality. Even for a 15 minute tease, this really does mean business. As promised, Runaway does indeed tell us a bit more about the character of Tilly with her facing a holographic communique from her mother professing her lack of support for her recently promoted daughter. Runaway therefore seems to be examining the innate abilities of both Tilly and the stowaway Po who both doubt themselves and their capabilities. Tinged with a few moments of humour, this Short Trek offers a little action but ultimately is all about the interaction between Mary Wiseman and Yadira Guevara-Prip. The two are fairly different in demeanour but ultimately realise there's more in common between them than they might expect. The neat factor here is how Xheans are connected to their planet since both were born at the same time making their homeworld effectively their twin. A steady story, there is a twist at the end to the tale but what I found was that I left watching this one thinking about how it will all link in to the bigger arc of season two - if at all? Track through it and there are the references to Xhea's importance because of the dilithium mining and also because of Po's incubator which recrystalises the valuable fuel source. I can't see this being a throwaway line or piece of plot given how much emphasis there was placed on virtually every line and shot in season one of the show (so what were the black badges all about by the way....?). I would think that there will be at least a reference back to this incident although how Po managed to stay totally hidden on Discovery and how Tilly managed to commandeer a transporter to send her back home is utterly flummoxing and probably best to ignore as a ridiculously big plothole. Mary Wiseman is super-watchable in the Tilly role with all the quirks and nuances of her character back in the fore. The communique with her mother at the start probably tells us the most about Tilly because of the way in which the two relate. I believe it says a lot about how the newly minted Ensign behaves since her mother seems to be such a dominant, controlling and disapproving parent! Runaway does exude quality ahead of the January 2019 return of the series. The crisp feel of the short and even the minor details such as Po's horizontally blinking eyes demonstrate that there's nothing being left to chance and everything is being fully realised. Everything must have a point! Talking of having a point...we've all seen the latest trailer huh? 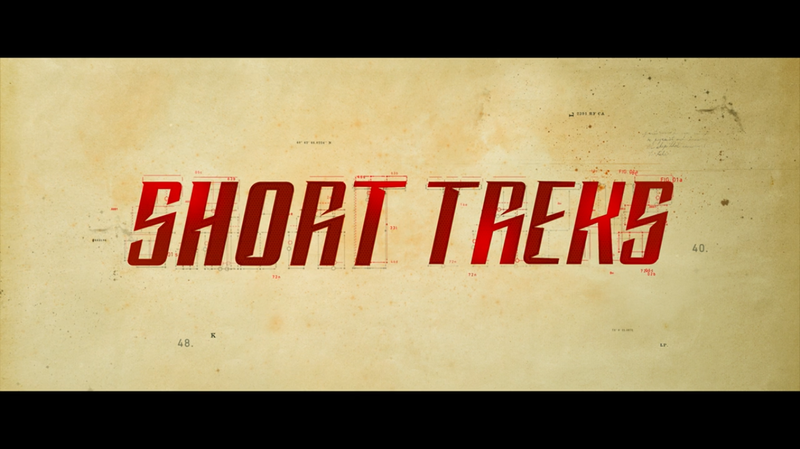 Well for once I watched it and thought about whether or not there was much point spending hours pouring over every frame because, let's be fair, everyone is talking about the final shots of Spock replete with beard. But there is actually more to this trailer than just the final few "oh my" seconds. As with the first trailer there's a lot more spacesuited antics from the crew and you can only hope that these exterior scenes are more in number than we saw in the first season. If you recall the trailers made a lot out of the space walks when there were only actually a couple of minutes focused on it (admittedly very key minutes...!). Pike is a major focus for the trailer with him appearing both in command yellow and the Discovery uniform throughout the two minutes of footage. He's in command but how much of the ship will be left might be debatable since we have shots of Burnham carrying an injured Saru through the corridors as panels and lights explode around them. What the trailer does tell us is that Discovery is being dispatched to find the source of seven signals which are spread out across the galaxy. Cleverly these signals have also been woven into the poster for the season and are linked not only to something called the "Red Angel" but also to Mr Spock. There will be a return for Mira Sorvino as Amanda since she is seen visiting Discovery and discussing Spock's adventures with his adopted sister. This Red Angel would appear to be the centrepoint for the main story of the year and while there was speculation it might be the return of the Borg and maybe this figure is the Borg Queen I would strongly disagree since that would diverge the universe more rather than bringing it all neatly together as we have been told this second batch of episodes will attempt. Now, one of the last things that we saw from season one was the cut scene of Mirror Georgiou being approached by a member of Section 31. It teased that the alternative version of the Shenzhou captain was likely to return and here (0.51 seconds in) she indeed does. Georgiou is in hiding or undercover, shifting her image from an alien to the visage of Michelle Yeoh - and that hint of Section 31 is back with (shocker) an insert of Yeoh holding the black badge - pay off - as well as her turning up, fully leather clad and honing her inner Intendant with Pike and Burnham on the Discovery. Interspersed with the new clips we have more of the flying pods, more spacesuit walking thrugh alien ruins as well as that haz-mat style tunnel being led by some forms of aerial drones but it just gets better with two other things. One is the shot of the Klingon D7 cruiser on a lovely green schematic for just a moment and the second is the return of the Klingons. Since Georgiou was last located on Quo'noS it makes perfect sense that we would end up back there. In a shot I spotted of Jonathan Frakes directing one of his two instalments this season, Shazad Latif was in shot which confirms his return to the show and here we know that L'Rell will also be back - but there are other Klingons in the mix too. Suiting up and now with added hair it might seem from what we see in this trailer and it's incredible to think that adding just that one thing makes them look a lot closer to the image we have that was first introduced in The Motion Picture. Making another first appearance in the Discovery era is Rebecca Romjin in command colours as Number One. A role filled originally by Majel Barrett-Roddenberry for The Cage, Romjin only gets a brief introduction on screen here but I am really intrigued as to how they will bring her into the story and for how long since we only see her in the Enterprise yellow. So next question - what the hell is Stamets pulling out of Tilly with that giant gun thing? Is it related to the spot of liquid that fell on her in the closing scenes of season one? Will it all link back? Does it have any relevance to that mighty machine that the crew are standing around on a planet surface? Is that in turn linked to the Red Angel? Lots of questions raised in these two minutes and some only very briefly dabbed at with a few key shots. In fact the remaining minute of the tease is made up of more explosions and chasing through asteroid fields in the Discovery pods before the final big kick which is the reveal of an (shock horror gasp) unshaven Spock being awoken. It's fair to say that fandom went into a bit of meltdown over this but really?! It's 2018 and we have to move on. Discovery is always going to be different...production values...scripting...look....smell...can we not just accept that it's not 1966 anymore? 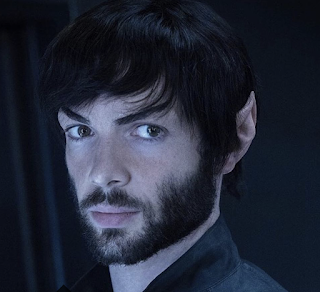 Ethan Peck is going to be playing one of the youngest versions of Spock ever seen and who is to say what he's been going through and what's been happening since this an unknown portion of his life. This Spock is a junior officer, inexperienced and just beginning to make his mark. We'll almost certainly see quite a different Vulcan to that as portrayed by Nimoy or even Zachary Quinto. In the trailer Spock is being transferred to a medical unit (to or from?) and being awoken from his sleep - but to what and for why is this all happening? For me the trailer only really throws up some big questions two or three times and relies on a lot of footage that must be from the first couple of shows. Only the Red Angel suggests the link for the season that will draw the characters together - but what's it all about...?